Artist/Author: Slater, Peter, Sally Elmer and Raoul Slater. 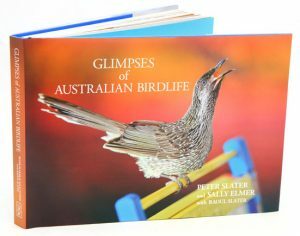 The authors have selected their favourite photographs of Australian birds, taken over the past 65 years, some with primitive and clumsy equipment and others with the latest digital cameras, accompanied by observations and anecdotes. 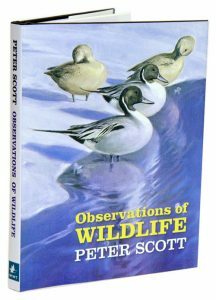 Peter Scott, founder of the Wildfowl and Wetland Trust (WWT), is one of the most influential figures in conservation history, but much of his enthusiasm for wildlife was most visible through his paintings of nature. This book showcases a colourful collection of some of his finest pieces of artistry, drawing from forty years of his life. 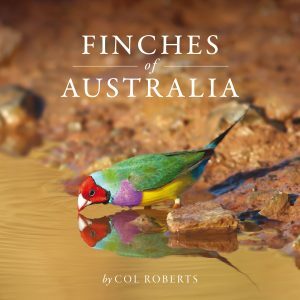 Scott’s work both as a conservationist and artist has achieved international acclaim and inspired generations, and his two passions are elaborated in detail in this book. First published in 1980, this book features high quality reproductions of his artwork, including paintings, drawings and fascinating pages from his notebooks and diaries. The text describes Scott’s career, working methods as an artist, global travels and his commitment and concerns about nature – issues that are still just as significant in today’s environment. Artist/Author: Bates, John and James H. Boone. 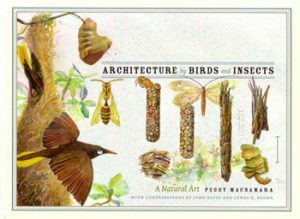 Birds and insects are nature’s premier architects, using a dizzying array of talents to build functional homes in which to live, reproduce, and care for their young. Recycling sticks, branches, grass, and mud to construct their shelters, they are undoubtedly the originators of “green architecture.” A visual celebration of these natural feats of engineering and ingenuity, this book allows readers a peek inside a wide range of nests, offering a rare opportunity to get a sense of the materials and methods used to build them. Inspired by the vast nest collection at the Field Museum, Chicago, which features specimens gathered throughout North and South America, Peggy Macnamara’s paintings are enhanced by text written by museum curators. This narrative provides a foundation in natural history for each painting, as well as fascinating anecdotes about the nests and their builders. 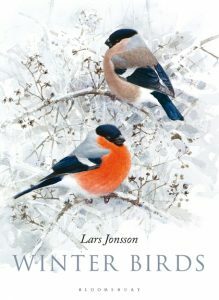 This is a fully revised and updated new version of a popular RSPB handbook to the art and joy of drawing birds. 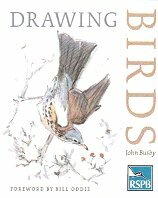 John Busby beautifully conveys his own remarkable ability to capture the grace and motion of living birds, illustrating his ideas and suggestions with many examples of his own work. 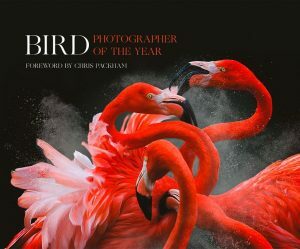 He also uses illustrations from over 45 other talented bird artists to demonstrate a variety of principles and techniques. The text covers a wealth of topics, including choice of media, sketching from life, composition and different ways of interpreting the subject matter. 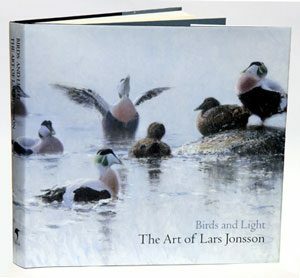 Birds and light: the art of Lars Jonsson. 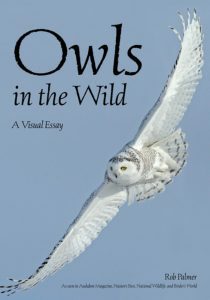 This book is part autobiography and part exploration of technical method, and is a celebration of birds, wildlife and wild places. It is illustrated throughout with sumptuously reproduced artwork, including pages from his earliest sketchbooks, examples of his identification plates, through to the development and completion of finished canvases. 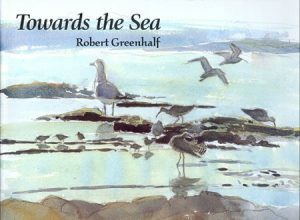 Towards the sea is a record of Robert Greenhalf’s encounters with wildlife throughout the year in his home area of Romney Marsh in south-east England, and on visits to the north Norfolk coast and Bardsey Island in north Wales. It contains a wealth of drawings, watercolour sketches and finished paintings, interspersed with diary extracts and short essays describing the pleasures and problems of working in the field. 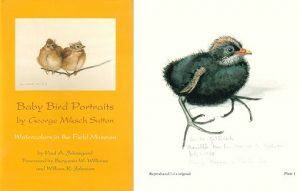 Baby bird portraits by George Miksch Sutton: watercolors in the Field Museum. 35 paintings of downy chicks, nestlings and fledglings painted from life by Sutton.